King Willem-Alexander and Queen Maxima of the Netherlands are in Japan this week, dropping in on their imperial counterparts, Emperor Akihito and Empress Michiko. A glittering state banquet is planned, and when the Dutch king steps into the ballroom, he'll be wearing the red and blue sash of Japan's highest chivalric order: the Order of the Chrysanthemum. 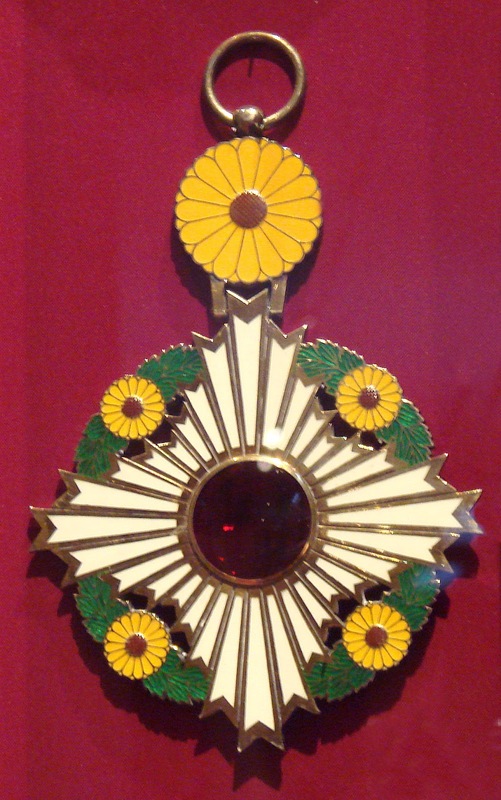 The Order of the Chrysanthemum is the highest order of chivalry in Japan. As far as chivalric orders go, this one's pretty new: it was developed by Emperor Meiji over ten years in the 1870s and 1880s. The emperor is the order's sovereign, and it is awarded "at his pleasure." If you're a Japanese citizen, this is the highest national order you can get, and it is very rarely awarded. And, in an interesting quirk, you can get it even if you've already died -- appropriate for a culture that honors the spirits of its ancestors, the order can be awarded posthumously. The order only has one class, but sometimes recipients are given the collar of the order (the highest "rank") while others are given the grand cordon. The chrysanthemum flower is an important symbol of Japan's monarchy. The phrase "Chrysanthemum Throne" is used to refer to Japan's emperor and imperial family. The flower is on the imperial seal; the empress wears a diamond tiara with chrysanthemum motifs; and the nation's highest order of chivalry also features the flower prominently in its insignia. The order's badge and star feature a four-pointed white enamel star with a cabochon garnet set in its center, surrounded by yellow chrysanthemum blossoms and green chrysanthemum leaves. The order's sash is red with blue stripes at each border. Ordinarily, the order is only awarded to men. But when foreign royals -- specifically sovereigns and heirs to the throne -- are considered, the order is also given to women. Queen Elizabeth II has the order; so does Queen Margrethe II of Denmark. Other living monarchs to have the highest "rank" of the order (the collar) include Harald V of Norway, Carl XVI Gustaf of Sweden, Abdullah II of Jordan, and Mohammed VI of Morocco. The lower "rank" of the Chrysanthemum, the grand cordon, is often given to monarchs' heirs. Crown Princess Victoria of Sweden has the grand cordon, and so do the Prince of Wales and Crown Prince Frederik of Denmark. But you don't have to be the heir to get the grand cordon -- the Duke of Edinburgh has it, and so does Prince Joachim, the second son of the Danish queen. King Philippe of Belgium also has the grand cordon, though I'd expect we can see him "upgraded" the next time the two nations meet for a state visit.